Yes, Little Man has won and he got not one, but two guinea pigs. 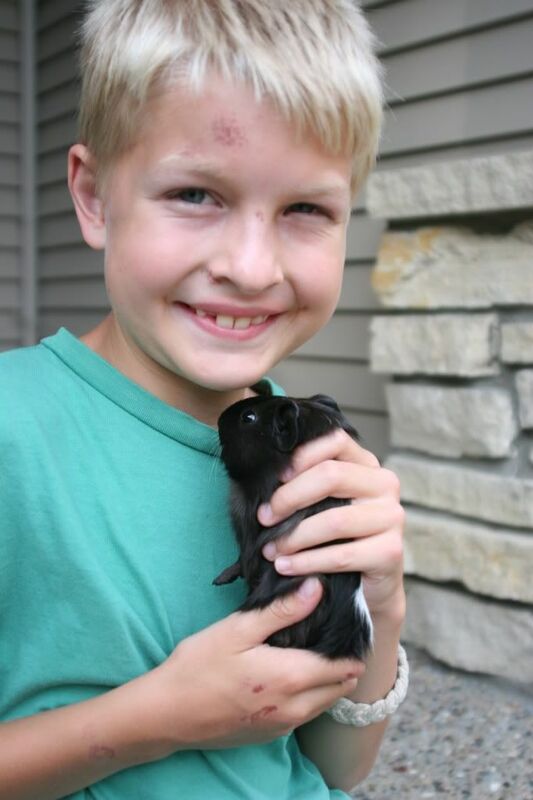 We went to the pet store yesterday with the idea of getting a $35 guinea pig, but the one Little Man wanted was sick. So, they pulled some babies out of the back (they were only 26 days old) and they were willing to let us adopt one for $10. Due to the fact that she was so young and never away from her mama they recommended getting a pair. We ended up getting two of them. Don't worry- we made sure that they were both females. Little man paid for both, but we got him started with the supplies. From now on he's on his own though. He will be responsible for food, all supplies, and cleaning the container weekly. We'll see how long that lasts. He named the black one Koko- not sure on spelling yet (he has one black foot and 3 pink ones) and Pokey named the brown fuzzy one Penelope, Penny for short. When she can show more responsiblility and is able to pay Little Man $10 she will be able to have Penny. I'm not sure she understands that she will also have half the responsibilities. We'll have to cross that bridge later. Unfortunately they are not going to be able to live in the tree house like I had hoped. We learned that they are very sensitive to heat and cold and that they could die easily. Bummer. I would have let them stay in the garage in the winter. Oh well. Little Man will house them in his room, but I've warned him that if I smell them they are gone. They are funny little creatures. They make many strange noises and we haven't figured them out yet. I'm a little overwhelmed and not quite sure I should have caved so quickly, but I have to admit they are pretty cute little things. I prefer the little wooly one. She is much more active too. Little man did think long and hard about what he wanted and even did a little research about them prior to purchasing. Ask me in a week how it's going. By the way, if you haven't followed the blog, Little Man crashed on his scooter a few days ago. I am pleased with how quickly it all seems to be healing, but I'm not sure it'll be healed before the end of the month for photos. oh boy Lish, good luck with that C: Who's doing your pictures? You can easily photoshop that. I have magically made my kids skin look perfect with photoshop C: Can't wait to see the family pics!! You are brave letting them have pets...My kids keep asking us for something and we just say no. I am not big on animal smell in my house, so if we ever get a pet we will follow the same rules in you house.